The peer-reviewed international scientific journal Communicology is registered June 10, 2013. It covers the issues pertaining to the theory and practice of communication, in particular: communication theory, mass communication, mass media, sociology of mass communication, intercultural communication, political communication, marketing communications, public relations, and communicative mechanisms for the formation of intangible values (image, publicity, brand, reputation, etc.). 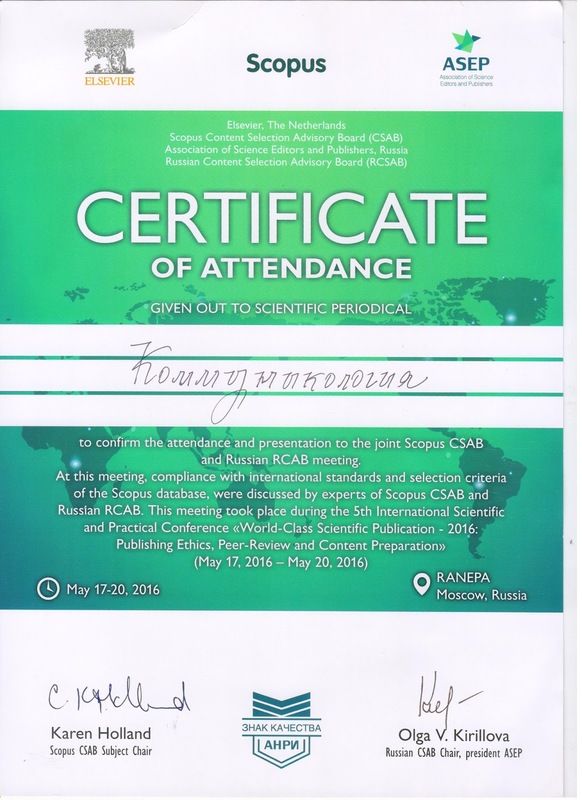 The journal is headed by doctor of sociological sciences, professor, honored scientist of the Russian Federation Felix Izosimovich Sharkov, member of the core team of experts - reviewers for the Scopus Main Classification Subject Field (s) of the Russian Council for the Evaluation of journals proposed for inclusion in SCOPUS (RCAB / ECSAC for SCOPUS). The journal provides a platform for scientific discussions and facilitates the release of the results of research of scholars, expert crews, postgraduate and doctoral students on relevant matters. The adopted provision on the journal allows any reader to contact the authors and get in direct contact with the members of the editorial board. This enables communication between the authors and the readers and promotes the development of the scientific network for communication studies. To attract new readers, students and practicing experts, the editorial board holds open roundtable discussions and conferences, develops the online library on communication studies, and covers its recent and upcoming activities in the newsfeed of the website. the basic scientific results of theses on competition for a scientific degree of a candidate / doctor of science by branches of science: 22.00.01 – Theory, methodology and history of sociology (sociology); 22.00.03 – Economic sociology and demography (sociology); 22.00.04 – Social structure, social institutions and processes (sociology); 22.00.05 – Political sociology (sociology); 22.00.06 – Sociology of culture (sociology); 22.00.08 – Sociology of management (sociology); 23.00.01– Theory and philosophy of politics, history and methodology of political science (political science); 23.00.02 – Political institutions, processes and technologies (political science); 23.00.06 – Conflict resolution studies (political science); 24.00.01 – Theory and history of culture (cultural studies); 24.00.01 – Theory and history of culture (philosophy). The journal is indexed by the Russian Science Citation Index, VINITI RAS, EBSCO, and ULRICHSWEB. Centre of Research and the introduction of innovative technologies of management organizations "OPTIMA PROJECT" (119019, Russia, Moscow, Volkhonka st. 15).